This website uses first-party cookies to permanently store and remember the different settings and options of this site. No third-party cookies are used. If you choose to disable the usage of cookies for this site, functionality will be greatly reduced. Find more information about how to change or delete these cookies, or avoid their storage on your computer. By further using this website you agree to the use of these cookies. I understand, don't show this message again. Welcome to the World Boss Timer powered by Silver Sunshine [SiSu]. This timer contains a list of world boss event starting times for Guild Wars 2, as well as entries for non-timed world bosses and event chains that reward bonus chests. 1. World boss or event chain title. Glows orange if world boss is one of the organized major world bosses. 2. Zone name the world boss is located at. Glows purple if zone contains some of today's daily achievements. Move mouse cursor over symbol or zone name to discover specific daily achievements. If "Click & Copy" option is active, waypoints can be copied by simply clicking on them. This feature requires at least Internet Explorer 10, Firefox 41, Chrome 43 or Opera 29. Waypoints can be copied on older browsers by pressing Ctrl+C. In both cases, waypoints can be pasted into any active game chat by pressing Ctrl+V. 3. Start time. Appears purple if world boss is part of the daily world boss achievement. Click on the start time to display countdown in hours and minutes. Click again to return to start time view. If no start time is specified, world boss is non-timed. Non-timed world bosses are listed separately. See below for more information. 4. Click to label boss as done by player. Turns orange after being clicked on and hides boss for all remaining start times except if specified otherwise in settings. 5. Click to pin event. Pinning avoids hiding the particular entry even if specified otherwise in settings. If any event is pinned, only pinned events trigger audio alert. Otherwise, any event will trigger audio alerts, except if option "Play pinned events only" is set. 6. Orange corner indicates organized major world boss. Purple corner and frame indicate boss is today's daily boss achievement. 7. 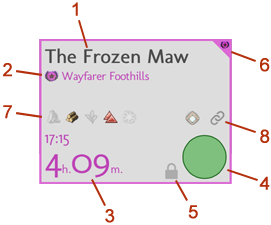 Shows detailed information about all daily events in the same area if extended display is enabled in options. 8. Links to the Wiki boss article (if available) as well as to a map that shows the pre-event starting points (yellow circles) and boss spawn point (orange symbol). - Option settings offer more detailed explanations when moving mouse cursor over them. - This timer relies on the operating system time on your computer. Make sure time as well as time zone for your location are set correctly. - Be aware that starting times are valid for already open server instances only. Instances that are opened shortly after the start time can launch the world boss event up to several minutes later. - Some world boss event chains have very short pre-events and can start quickly, as well as finish quickly. Be sure to arrive early in order not to miss the event chain or final event. - If you label any event as done by mistake, you can use the undo button at the top bar in order to cancel the last action. You can go back in label history up to the page session start. - Data for automatic daily achievements comes from collected game server data. If that data changes in-game, automatic daily events are temporarily deactivated and the star icon can be used to manually set a boss for the current daily achievement. - Take into account that automatic daily achievements are based on level 80 characters. If the game account has characters with levels under 80 only, daily achievements can vary to suit the maximum level. - Pro-tip: Keep Shift-key pressed in order to show all remaining events even when you already marked them as done by player. Very useful when some friend asks you for any active event you might have already done. Optionally, give him the link to this timer! v6.1.4. © 2014, 2015, 2016, 2017, 2018 Frank Meyer-Pfauder. Feedback: /u/SonnigerTag. Special thanks to Yornn.4751 for French translations. This site is not associated or affiliated with ArenaNet or NCSOFT Corporation. © 2014 ArenaNet, LLC. All rights reserved. Guild Wars 2 and all associated logos and designs are trademarks or registered trademarks of NCSOFT Corporation. All other trademarks are the property of their respective owners. Female audio voices by Corsica_S (freesound.org). Male audio voices by BrandonTGN and EnjoyPA (freesound.org). Sound effects by Alexander (orangefreesounds.com), ultradust (freesound.org) and joedeshon (freesound.org). Audio voices and sound effects licensed under Creative Commons CC BT 3.0 (creativecommons.org/licenses/by/3.0/) Additional sound effects licenced under Creative Commons CC0 1.0 (creativecommons.org/publicdomain/zero/1.0/). Welcome to the World Boss Timer powered by [SiSu]. Each entry displays data like boss name, location in Tyria, as well as start time or time until event starts. Press the green button to mark any boss as done by player. Please refer to the Help section or see information under each setting for further usage. Events without specified time are non-timed and can start at any time after cooldown or by being triggered by players. 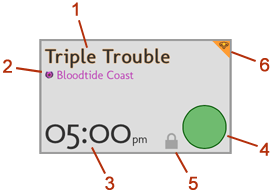 Event times labeled as active are indicatives only, the corresponding event can last more or less time. It's recommended to be at the event place before its start time. Powered by Silver Sunshine [SiSu]. Guild Wars since 2005. Shows all world events, including past ones and those labeled as done by player. Works only when 'Show all world events' is set. Shows only events that start within 3 hours from current time. Shows the last finished event before the actual, if it has not been marked as done by player yet. Lists non-timed events first, and afterwards timed events. Default ist timed events first, non-timed event afterwards. Hides past pinned events. This option does not unpin the event. Saves pinned events permanently or only until next reset. Shows the recommended player level next to each boss name. Show AM/PM times or 24 hours times. Automatically displays all relevant daily achievements based on game server data. This setting can not be changed manually.Automatic highlighting of daily achievements is disabled due to game server updates. This setting can not be changed manually. Use the star symbol to mark any boss as daily boss. Extends display to show detailed achievement information as well as links to maps and the Guild Wars 2 Wiki (if available). Shows zone links when moving over with mouse cursor. To copy, press Ctrl+C, to paste into the game, press Ctrl+V. Generates extended information within link, including world boss name and remaining time until start. Adds the recommended player level to extended waypoint link. Automatically copies waypoint to clipboard by pressing mouse button on it. Compatible with latest browsers only, see Help for more details. Plays the selected audio alert at event start. Use the speaker symbol to prelisten alert. Option "Artificial" is not compatible with Internet Explorer. Requires Microsoft Edge or HTML5-compatible browser. Plays the selected audio alert 5 minutes before event start. Use the speaker symbol to prelisten alert. Option "Artificial" is not compatible with Internet Explorer. Requires Microsoft Edge or HTML5-compatible browser. Plays the selected audio alert 20 minutes before event start. Use the speaker symbol to prelisten alert. Option "Artificial" is not compatible with Internet Explorer. Requires Microsoft Edge or HTML5-compatible browser. If marked, audio alerts will be played on pinned events exclusively. If not, audio alerts will be played on pinned events or on any other event if none is pinned. Shows daily achievements for the base game. Achievements are valid for F2P game version too. This setting can not be changed manually. Shows daily achievements for players with this expansion pack. Achievements related only to the base game are not shown. Beware: this function is currenly unavailable, the official API offers no support since Path of Fire. Achievements from all versions are shown at the time.